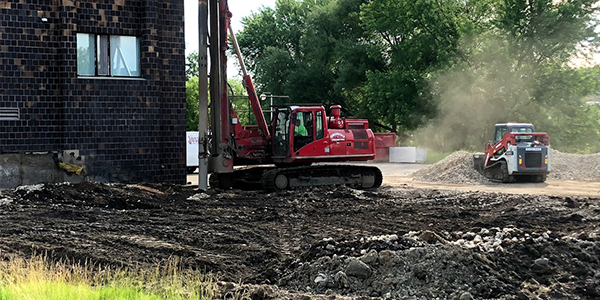 The Northfield Fire Station expansion project site encountered a high-water table as well as weak soils. Subsurface Constructors installed 104 stone columns to provide a maximum bearing pressure of 2,500 pounds per square foot (psf). The soil profile consisted of lean clay fill soils to an average depth range of 6.5 to 11.5 feet. This sat atop natural soils composed of organic lean clay, sand, gravel, silty sand and gravel soils to the borings’ termination depth of 17 to 23 feet. Geotechnical Engineer: Chosen Valley Testing Inc.
General Contractor: The Joseph Company Inc.